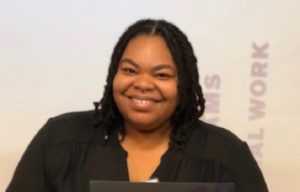 Jasmine shared her experience as a crisis services center intern at the National Runaway Safeline responding to crisis communications on our hotline and online services, training volunteers and more! I have learned ways to provide effective service without having face to face contact, which was probably the biggest challenge for me first starting off as a crisis services intern. Prior to interning at the National Runaway Safeline (NRS), I was only familiar with direct contact work and service. I was challenged here at NRS and referencing the crisis intervention model at all times was necessary and very helpful. I have also gotten lots of helpful feedback along the way. 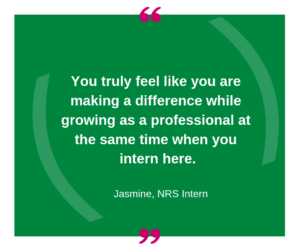 It’s fun and rewarding to be an intern here at NRS. I feel like some of the best people on the planet are just piled up here and I enjoy being here. At times it could be challenging doing this kind of service with the demands of our day to day lives and obligation but, when it’s busy and demanding, everyone is supportive and re-affirming. You truly feel like you are making a difference while growing as a professional at the same time when you intern here. Everyone here makes you feel like you belong and the work you are doing is important. I would recommend this experience to someone else because you get a multi-faceted experience here at NRS and get to have an experience with an organization that is a powerful force behind a very important cause. Not only do you improve and implement skills that can better your overall character but, the skills you learn can also be applied to the work you do occupationally (as a social service provider/advocate), and most importantly you get an opportunity to help make an impact with youth. I love being able to assure youth of their autonomy as humans and give them that opportunity here through offering our support by having non-directive engagement during calls. I feel that the society we live in completely strips youth and children of their human right of basic autonomy and decision-making, as if they’re not capable. I feel that through the work we do here at NRS we are being advocates in that way. We are currently accepting applications for our 2019/2020 internship program for both the summer and academic year. Interns at the National Runaway Safeline gain experience in delivering direct crisis services and with working on projects related to training, outreach, social media and prevention programs. Click here to learn more about our internship program.